Soda is refreshing, fun, and fizzy…too bad it’s also one of the most unhealthy foods on the planet. But guess what? 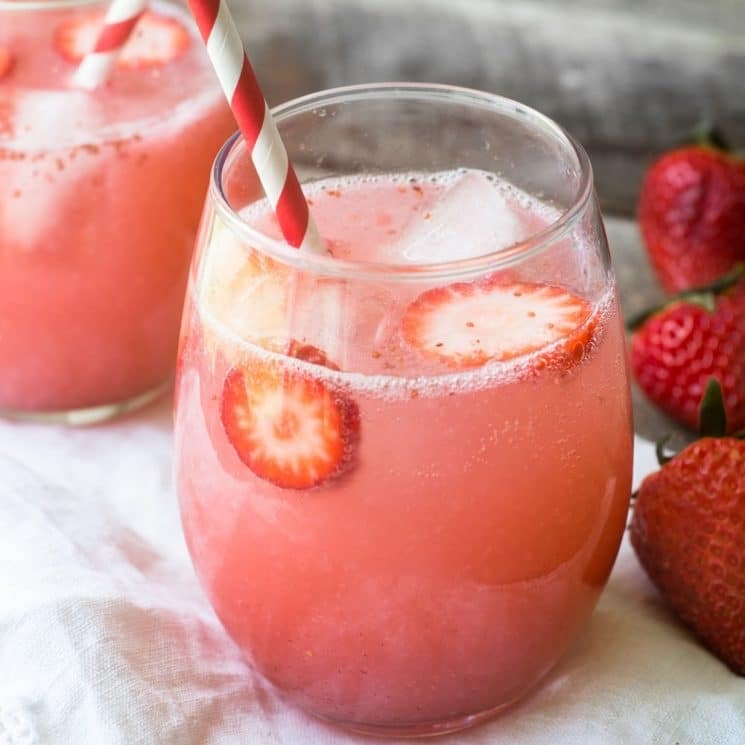 You can make an all natural sugar free fruit soda yourself in no time without any of the artificial flavors, colors, high fructose corn syrup, or chemicals — all you need is fresh fruit, and carbonated water! Hey everybody! It’s Sue from The View from Great Island, back with a game changing solution to a BIG problem. With the arrival of spring the weather is warming up, the days are getting longer, and kids are getting more active — and what do they want? Soda! Soda is one of the worst threats to our kids’ health these days and yet it’s virtually everywhere — in vending machines, convenience stores, restaurants, and that seemingly endless aisle in the supermarket. Of course they want some…it comes in pretty colors, it’s bubbly, and so refreshing. Fear not — I’m going to show you how you can keep your kids healthy AND hydrated with my all natural sugar free fruit soda. 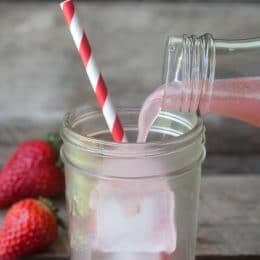 Today I’ve made strawberry soda using nothing but fresh ripe strawberries and carbonated water — and it couldn’t be easier to do. First I wash and trim the berries, and then puree them in my food processor. If you have a juicer or blender, that works fine too. I strain the puree through a mesh sieve to remove any seeds and then I’m left with a beautiful, thick, rosy base for my soda. All you have to do is to mix a bit of the puree with sparkling water and you’ll have a fizzy soft drink that is actually good for your kids. I use 2 tablespoons per 8 ounces of water, but you can customize the strength of the soda by adjusting how much of the fruit syrup you use. 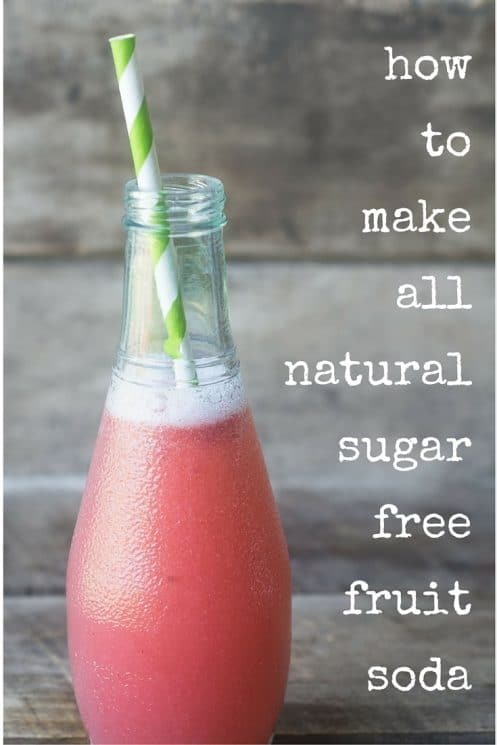 Starting your kids out on all natural sugar free fruit soda will help train their palates to enjoy natural flavors and a healthy level of sweetness. That will encourage them to make other types of good food choices as they grow. The fun thing about this ‘recipe’ is that you can work with almost any type of fruit, from berries and grapes to more exotic choices like papaya, and guava. Choose what’s fresh, ripe, and in season, because you want the fruit to be flavorful and juicy. You can even freeze the puree to make healthy soda all winter long. 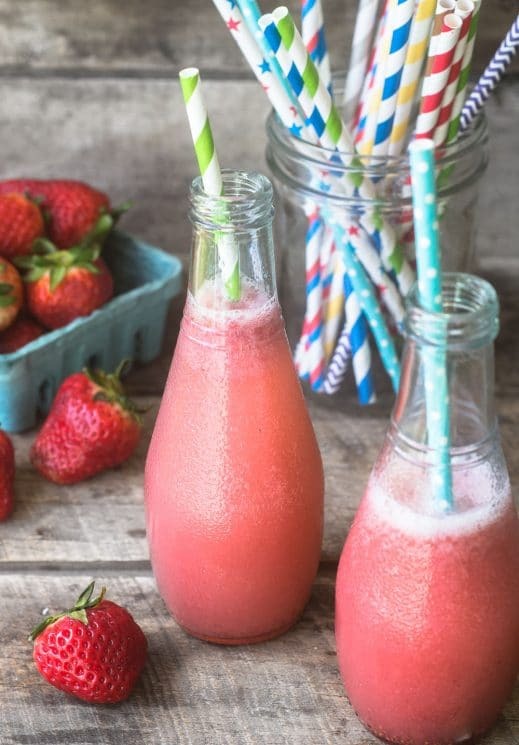 I say let the kids get involved and create their own custom flavors by mixing and matching different fruit combinations — I can imagine lots of hours of healthy creative fun — put out an assortment of fruit bases and give them a jug of carbonated water to play with. Offer colorful straws, and recycled soda bottles and let them experiment. How about a healthy no-sugar ‘lemonade’ stand featuring homemade soda? Wash and trim the strawberries. Place them in a food processor and pulse until they are rough chopped, then scrape down the sides of the machine. Puree until completely smooth. Let the machine run for a minute or longer to insure a nice smooth puree. Push the mixture through a mesh strainer, using the back of a large spoon to make sure as much of it gets through as possible. Most all of it should go through, leaving just the small seeds behind. You should have approximately a cup and a half of puree. 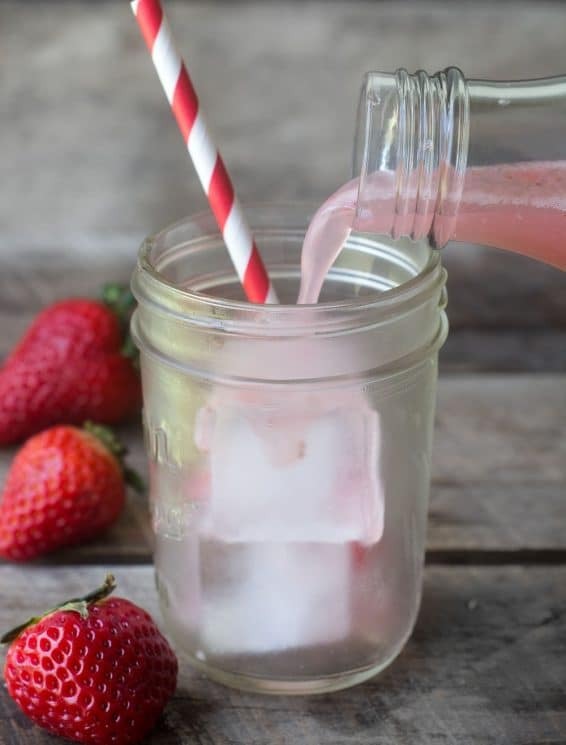 To make soda, use 2 tablespoons of the puree for each 8 ounces of carbonated water. Mix and then serve immediately. You can adjust the amount of puree for a lighter or stronger flavor. 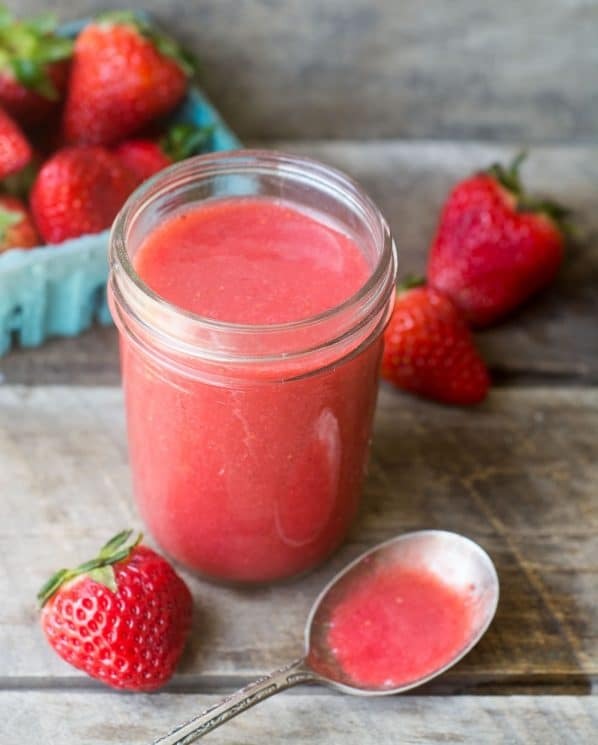 The fruit puree will keep in a sealed jar in the refrigerator for a week. If you like you can add a squeeze of fresh lemon juice to perk up the flavor of any fruit soda, and conversely, if you find your soda is too tart, add a touch of honey. This is so wonderful! Sharing with my family, especially those with children. Beautiful photos and I bet the homemade soda tastes amazing! Thank you! This is such a wonderful idea! I can’t wait to try it with my grandkids. Love the beautiful, natural color! My kids were homeschooled but since we moved and they went to school,all 3 are coming home after school with a can of coke/pepsi/seven up/fanta. I explained how unhealthy it is and showed them a few scary videos about what it does to your body,but they won’t stop,their friends are all getting a can after school and those drinks are very addictive! I tried getting them coke zero no sugar but turns out that is even worse. Tried this recipe just now,they love it! Their friends loved it as well. Hopefully this is what will help quit that bad sugary drinks habit. Would be good to clarify this is free of ADDED SUGAR, not truly sugar-free, since all fruit has natural sugars in it. Definitely a healthier alternative to high fructose corn syrup and other added sugars, but still not sugar-free. 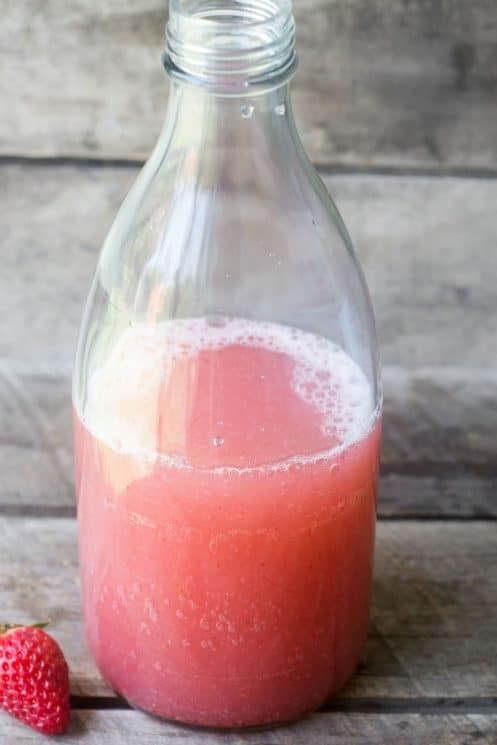 I clicked on the link to this interested to see how a “fruit soda” could be made, be delicious and still be sugar-free, and found I was somewhat deceived by the title.